Time and sequence a series of events. Perfect for radio talent needing to time a sequence of events. Will start the sequence at a specific time or now. For example, 10 minutes intro, 18 minutes for the body and then 12 minutes for the conclusion of the sequence. Another example would be for children taking turns on the computer. Sequence 20 minutes for the first child, 20 minutes for the second child, 20 minutes for the last child then repeat. 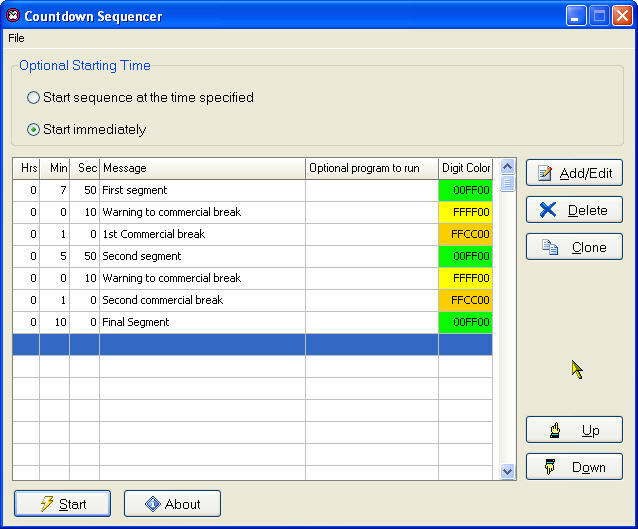 An alarm will sound between each sequence countdown.